September 3rd, 2013 12:38 PM | by William Bell | Eschatology. In discussing the subject of the kingdom of God and immortality, some writers and speakers have chosen to limit this concept to that of individual bodies. They believe that the focus of immortality, eternal life and incorruption has as its center, a remaking of the physical body of man. At its core, is the idea that man’s body is evil in some way, i.e. that it has fallen under a sinful nature from which it cannot escape in this life, except through death. Further, such escape is only available to those who obey the gospel. This thinking permeates futurism, many Calvinists and those who focus on individual body resurrection. In the creation, God said everything he made was good. That included man’s body. In addition, Solomon wrote: “Truly, this only I have found: That God made man upright, but they have sought out many schemes. Jesus pointed out that nothing which comes from the body defiles the man, but those things which proceed out of man that come from the heart. Therefore, it was always the man’s heart, his thinking and will that received the focus of God’s judgment. Our minds and bodies are made to glorify God. Sin affected the ability of man to work righteousness through his body because he was cast out of the presence of God. Man’s service to God must be viewed within the temple cultus. Only certain qualified men were able to labor in the temple. Those who were unqualified, i.e. Gentiles, women, non Levites were forbidden. They could not perform the services of the temple. Man’s body is designed to glorify God as an instrument of righteousness. While it is possible that Romans 6 is spoken to the church as a community versus individuals, each individual forms a part of that whole. In the body, we can “offer the sacrifice of praise, that is the ‘fruit of our lips'” to God, Heb. 13:15. We can also present our bodies as a “living sacrifice” (Rom. 12:1), and glorify God in our body, 1 Thess. 5:23. There is nothing inherently evil about the body. The fact that man sins and rejects God proves that he is the same creature God made in the beginning. Biology does not make man evil, but choice does. Man chooses evil by his thoughts for which he alone is responsible. We do not need to be delivered from the body because it is evil. The natural course is to die, (experience biological death) having completed our service to God in our bodies. Paul desired to depart and be with Christ but chose to remain to serve the Philippian church saying it was more needful. David, after having served his own generation fell asleep. That is a noble use of the body. Our physical bodies are for dwelling within this created natural world. That is the only reason we need them while here. Jesus was made a little lower than the angels for suffering and death, Heb. 2:9, but also to be a partaker in flesh and blood that he might destroy the works of the devil and thereby secure man’s release from Hades, (Heb. 2:14-15). See also Phil. 2:5-9; Heb. 2:10. According to Tom Holland, author of Contours in Pauline Theology and a Commentary on Romans, in the latter, he states the problem scholars are now recognizing and correcting in their understanding of the kingdom of God. 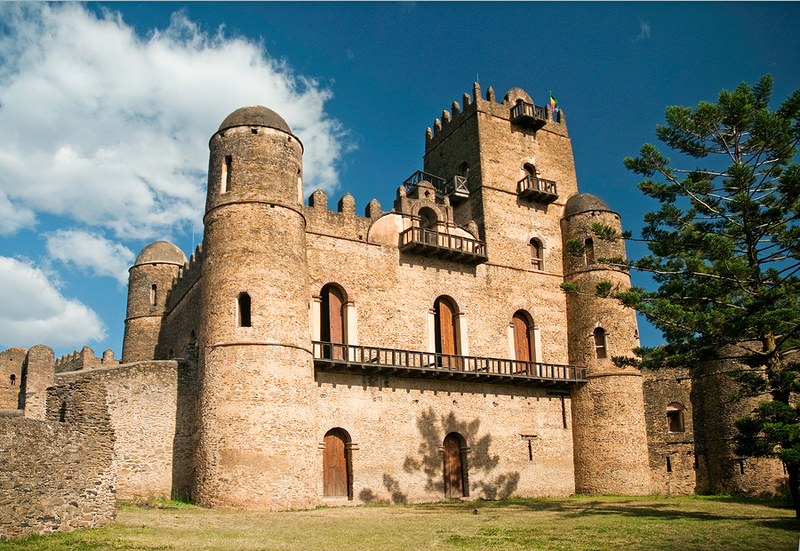 They have traditionally and historically focused on two kingdoms, one in which we participate now, and one which comes as an eschatological future. Holland now acknowledges along with a growing number of scholars that the Bible does not present two kingdoms in the gospels and epistles but two stages of the same kingdom of God. 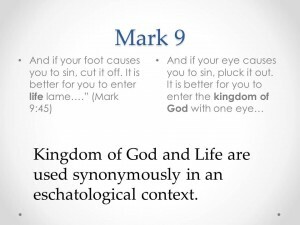 He argues that John see’s a realized kingdom in which we participate now as part of a realized eschatology. Some have understood Matthews gospel to teach the kingdom of heaven is now while the kingdom of God is future. Holland says Matthew’s use of the terms cannot be divided into such arbitrary category. For years we have advocated that the kingdom of God is one entity which involved a process of development, i.e. the beginning as a seed sown into the ground, a period of intermediate growth, until it is full grown and ready for harvest. See Matthew 13:38-43 and Mark. 4:26-29). Those text do not describe two kingdoms but one progressive kingdom which matures at harvest. There appears to be no difficulty in understanding the kingdom of God as a corporate body. How could it be otherwise? 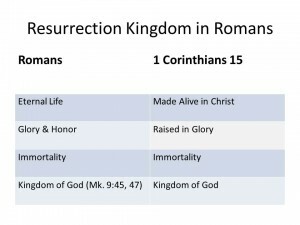 Yet, this is the “resurrection body” mention in 1 Corinthians 15 that seemingly no one wants to discuss. Rather, they’d like to keep the attention focused on the word body. However, it should be clear that Paul uses kingdom and body interchangeably and synonymously in his discussion of the resurrection. As we take a look at Romans 2, we will notice the description Paul gives of the resurrection body of 1 Cor. 15. Paul writes that those who continue in doing good would receive “eternal life”, “glory” “honor” and “immortality” (Romans 2:7). Note that this is the eschatological goal contrasted with the judgment of tribulation, anguish and condemnation. Holland argues that the reference to eternal life is entrance into the kingdom of God, i.e. the fulfillment of Daniel’s prophecy of the eternal kingdom. In both Daniel 12 and 2 Thessalonians 2:4-5, wrath and tribulation is contrasted with entrance into the kingdom of God. We therefore conclude that Paul’s reference in Romans is to the kingdom of God at the time of the Parousia. Glory and honor: It is sown in dishonor, it is raised in glory, 1 Cor. 15:43. Immortality: Mortal must put on immortality, 1 Cor 15:53-54. Eternal life, glory, honor and immortality: the kingdom of God, 1 Cor. 15:50. Note that all the terms used in Romans are used in 1 Cor. 15 to describe the resurrection, once again showing these are corporate terms relating to the kingdom of God. The kingdom is eternal life. It is also immortality and the power of God. To enter into the kingdom is to enter the resurrection of 1 Cor. 15. Those who teach the individual body resurrection have committed the error of dichotomizing eschatology and creating two end times paradigms, one in 70AD and another at the individual’s death. Rather, focus on resurrection should center on the kingdom of God rather than the body of man. « Does A First Century Return of Christ Create Christian Apathy?